Co-winners for the competition included Dan Olken, Afnan Ahmed, Alex Selden, Jessica Culver and Lukas Vogt. The Office of Sustainability Initiatives sponsored a poster session for students across many disciplines to present their sustainable projects and ideas during Earth Week. Student work came from workshops, courses and academic research in fields such as food studies, architecture, and engineering. 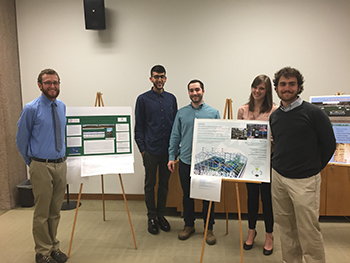 Finalists from the Campus Project Design Competition presented a sustainability-related venture they would like to see implemented on campus. Submitted proposals were intended to raise awareness and educate the campus community through examples that solve environmental challenges. Topics included a resource share program ‘CuseLight’, sustainable food production through aquaponics, and renewable wind energy. Co-winners for the competition included proposals for a SU aquaponics lab by Dan Olken, industrial design, Afnan Ahmed, biotechnology, Alex Selden, environmental engineering, and Jessica Culver, interior design and a wind turbine by Lukas Vogt, sustainable energy management. The Office of Sustainability Initiatives will investigate the option of creating pilot projects for each. “Earth Day means caring about everyone else and the world more than caring about ourselves. Highlighting projects that lead to a more sustainable future are what that is all about,” said said Alex Selden, a senior environmental engineering major. Other posters at the session earned awards as well. ‘Flower-Cuse’ by Michaela Wozniak, Architecture, and Coleen Carney, Arts and Sciences, won Most Creative Project. ‘Flame-Assisted Fuel Cell Furnace Combined Heating and micro-Power’ by Ryan Milcarek, Breezy Knight, Kang Wang, and Dr. Jeongmin Ahn, Engineering, won High Impact Idea. To learn more about sustainability at Syracuse University, visit http://sustainability.syr.edu.